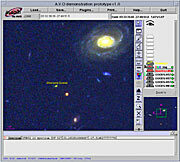 Astrophysical Virtual Observatory Proves To Be Essential Tool. Astronomers discover an entire population of obscured, powerful supermassive black holes. This unprecedented result, achieved through combination of information from multiple wavelengths, coming from different telescopes in the world, has been possible thanks to the Astrophysical Virtual Observatory project. Active galaxies are breathtaking objects. Their compact nuclei (AGN = Active Galaxy Nuclei) are so luminous that they can outshine the entire galaxy; "quasars" constitute extreme cases of this phenomenon, their powerful engine making them visible over a very large fraction of the observable Universe. It is now widely accepted that the ultimate power station of these activities originates in supermassive black holes with masses up to thousands of millions times the mass of our Sun. For comparison, the one in the Milky Way galaxy has only about 3 million solar masses. The central black hole is believed to be fed from a tightly wound accretion disc of gas and dust encircling it, in a donuts-shaped torus. Material that falls towards these gigantic "vacuum cleaners" will be compressed and heated up to enormous temperatures. This hot gas radiates an incredible amount of light, causing the active galaxy nucleus to shine so brightly. Because of this obscuring dust torus, the aspect of the AGN or the quasar may greatly vary. Sometimes, astronomers can look along the axis of the dust torus from above or from below and thus have a clear view of the black hole. Such objects are called "Type-1 sources". "Type-2 sources", however, are oriented such that the dust torus is seen edge-on from Earth, and our view of the black hole is therefore totally blocked by the dust over a large range of wavelengths from the near-infrared to soft X-rays. Type-2 quasars - where are they? While many examples of rather close-by Type-2 AGNs are known (so-called Seyfert 2 galaxies), it is still a matter of debate whether their larger luminosity quasar counterparts exist. Until very recently, very few examples of this class were known. One of them is the Type-2 Quasar CXOCDFS J033229.9-275106, discovered by combining observations taken in X-rays with spectra obtained by the Very Large Telescope. It is indeed a difficult task to find them. Because of the obscuring effect of dust, they cannot be found through standard (i.e. in the visible) methods of quasar selection. The only way to hope to drive them out of their bushes is to detect them through their hard X-rays which are able to penetrate through the torus. But this requires that astronomers can analyse and cross-correlate in a very efficient way the observations from several space- and ground-based observatories, which together span the entire range of wavelengths. Type-2 quasars can indeed be identified as the only objects appearing very red and at the same time emitting strongly in X-rays. This is where Virtual Observatories can play a decisive role. Major breakthroughs in telescope, detector, and computer technology now allow astronomical surveys to produce massive amounts of images, spectra, and catalogues. These datasets cover the sky at all wavelengths from gamma- and X-rays, optical, infrared, to radio waves. Virtual Observatories are an international, community-based initiative, to allow global electronic access to available astronomical data in a seamless and transparent way. 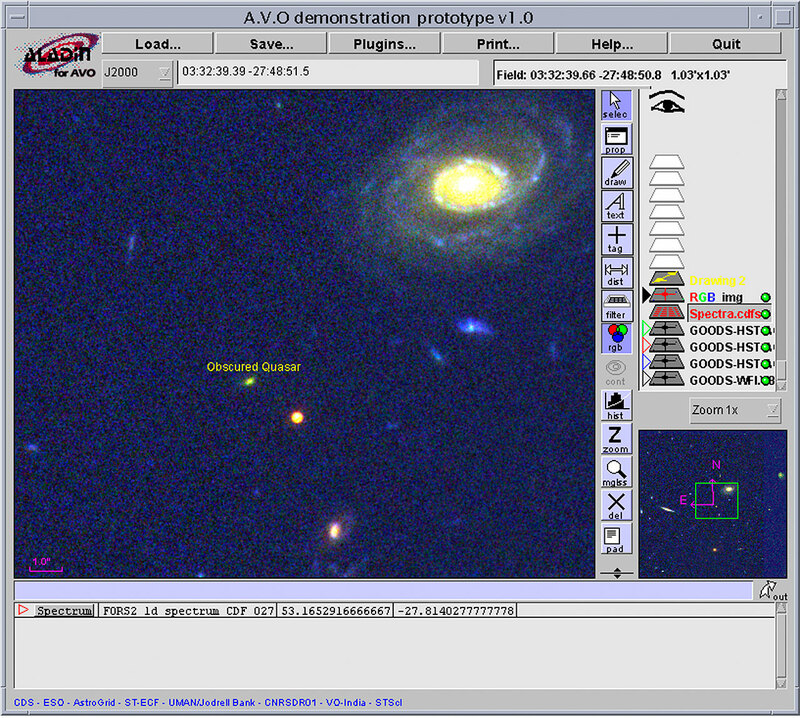 The Astrophysical Virtual Observatory project (AVO) () is the effort in Virtual Observatories of the European astronomical community. Funded jointly by the European Commission and six participating European organisations, it is led by the European Southern Observatory (ESO). The AVO science team headed by Paolo Padovani (ST-ECF/ESO) was able to use the first prototype of the AVO to provide unprecedented results on the existence of Type-2 quasars by discovering an entire population of obscured, powerful supermassive black holes. For this, they specifically scrutinised the so-called GOODS fields , i.e., the Hubble Deep Field-North and the Chandra Deep Field-South. These GOODS fields include some of the deepest observations from space- and ground-based facilities ever made and are the most data-rich deep survey areas in the sky. Padovani and the team used the Astrophysical Virtual Observatory to combine information from multiple wavelengths, originating from ESO's Very Large Telescope (VLT), the Hubble Space Telescope (HST) and the Chandra X-ray satellite. This allowed them to discover 66 Type-2 AGN candidates in the GOODS fields, among which 30 qualify as optically obscured quasars, i.e. Type-2 quasars. Only 9 objects of this type were previously known to exist in the GOODS fields, so this result effectively quadruples the known population of Type-2 quasars. From this, the astronomers can infer the total number of Type-2 quasars and their associated black holes. According to Paolo Padovani: "This discovery means that surveys of powerful supermassive black holes have so far underestimated their numbers by at least a factor of two, and possibly by up to a factor of five." The newly discovered type-2 AGNs have a mean redshift  close to 3. The new Type-2 quasars are even further, with a mean redshift of 3.7. Thus, they are seen as when the Universe was only 1,600 million years old. "These discoveries highlight the kind of scientific impact that Virtual Observatory technologies and standards will have on astronomy world-wide", says Peter Quinn (ESO), Director of the AVO. "The Astrophysical Virtual Observatory wants to continue to work with astronomers in Europe to enable more discoveries like this, using combined data from ground- and space-based observatories". : The AVO science team behind this discovery acted on priorities set by the community Science Working Group. The team is led by Paolo Padovani (ST-ECF/ESO) and comprises the scientific leads of the AVO partner projects, Mark Allen, AVO Project Scientist at the Centre de Données Stellaires (Strasbourg, France), Nicholas Walton, Project Scientist of AstroGrid (PPARC, UK), and Piero Rosati (ESO) of the GOODS and CDF-S science team. The European Commission has recognised the fundamental importance of applying advanced new computational and information discovery techniques in enabling and speeding the astrophysical research process. To this end, through its Framework 5 programme, the EC has funded 50% of the Astrophysical Virtual Observatory, specifically to develop an advanced Virtual Observatory framework to enable European astronomical research. : GOODS (The Great Observatories Origins Deep Survey) is an international effort (on the ESO side, led by Catherine Cesarsky) that focuses on the coordination of deep space- and ground-based observations on a smaller, central area of the HDF-N and CDF-S in order to image the galaxies in many different spectral wavebands, from X-rays to radio. : In astronomy, the "redshift" denotes the factor by which the lines in the spectrum of an object are shifted towards longer wavelengths. Since the redshift of a cosmological object increases with distance, the observed redshift of a remote galaxy also provides an estimate of its distance. The paper describing these results has been accepted by the research journal Astronomy & Astrophysics ("Discovery of optically faint obscured quasars with Virtual Observatory tools" by P. Padovani et al.) and will be published in an upcoming issue. The paper can be downloaded from http://www.eso.org/~ppadovan/AVO-paper.pdf. The AVO web site is at http://www.euro-vo.org/.